In simple terms, account-based marketing is a laser-focussed approach to B2B marketing in which a specific organisation (i.e. an account) is selected as a target from the outset of a campaign, and is then treated as a market of one as the campaign is developed. In essence, ABM really is exactly what it sounds like – marketing that’s based around appealing to and winning the custom of one single account. Of course, more than one organisation can be targeted in this manner, but the important thing to remember with ABM is that any organisation selected for targeting is treated as if it’s the only one in the market. Companies that use account-based marketing create hyper-personalised content designed specifically to solve the particular pain points of a target organisation. The strategy is then to get this content in front of the buyers, board members and key decision-makers at the target account, engage them with further personalised, educative messages, and then nurture them carefully along the path to purchase. ABM differs from the more traditional inbound approach to B2B marketing (and note that ABM is really only relevant in the B2B space), which aims to generate sales leads from a large pool of potential prospects. Inbound marketing focusses on drawing anonymous traffic towards a company’s website through the creation, publication, and promotion of content – blogs, infographics, white papers, eBooks, videos, social media posts, etc. – and from this traffic identify potential leads via a process of contact capture and email lead nurturing. 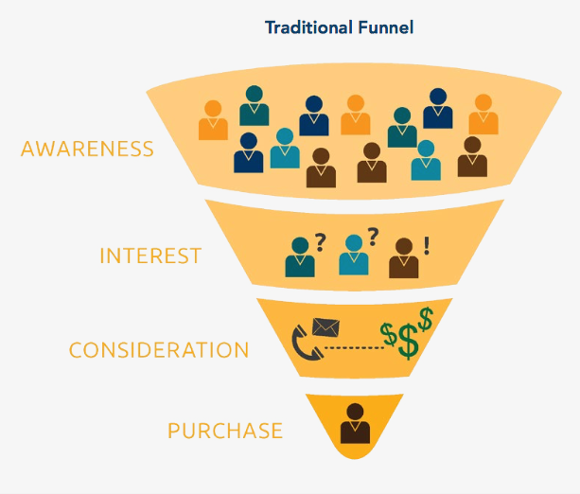 In this sense, inbound marketing works to move prospects down the traditional sales funnel. The overall aim is to pile as many good-fit companies (i.e. companies that potentially have a need for the B2B product, service or solution being sold) into the top of the funnel as possible, and then, through a process of engagement, education, and nurturing, separate the wheat from the chaff, and work towards making a number of sales at the bottom. The account-based marketing methodology, by contrast, flips the traditional sales funnel on its head. Rather than ploughing resources into generating hundreds or even thousands of leads – out of which only a handful will ever qualify as “good-fit” – ABM marketers do their research to identify “best-fit” organisations at the outset, and resources are then focussed on engaging only the key buyers and decision-makers within them. As such, the traditional sales funnel is inverted. 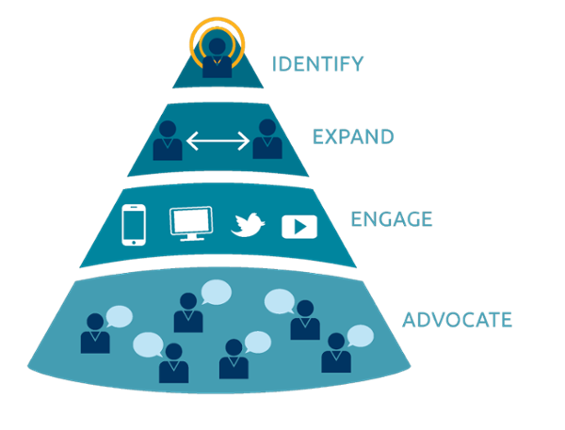 Let’s break down the four stages of the ABM funnel so you can understand how the approach works at every stage. Identify: Sales and marketing work togetherto research and identify target accounts (i.e. organisations) deemed to be “best-fit” for the solution, product or service being sold. Expand: Since there is usually more than one person involved in making purchase decisions at B2B companies, these individuals are identified (using online resources and networks such as LinkedIn) to expand the potential reach within a target account. Engage: Now that you know exactly who your buyers are – you will even know their names by this point – you can create content tailored to each of these individuals specifically, and connect with them on channels where they are most active (email, social media, events, tradeshows, etc.). Advocate: By creating amazing, personalised experiences through your hyper-targeted marketing efforts, the aim is to turn these decision-makers into advocates of your product, service or solution, who will then “fight your corner” at internal board meetings during which purchasing decisions are discussed. Many of the traditional B2B inbound and content marketing tactics are still utilised within an ABM programme – email marketing, social media marketing, blogs, research reports, videos, etc. The difference is how these tactics and materials are used in execution. With ABM, the aim of any content produced is not to engage as many people as possible, generate as many social media shares as possible, nor even to capture as many email addresses as possible. Rather, the purpose is to pique the specific interests and address the specific concerns of specific stakeholders within specific organisations with hyper-personalised and highly-tailored content. Any blog posts, eBooks, white papers, case studies, reports, videos, infographics, or any other content that is created for an ABM campaign are specifically designed for one single account and one single account only. Even so, ABM should not be thought of as a replacement for inbound. In fact, the two can complement each other greatly. Indeed, it must be remembered that both account-based marketing and inbound marketing share the exact same goal – to generate high-quality sales leads and opportunities. Both disciplines also value relationship-building, and utilise content to solve the pain points of potential customers before, during and after a sale is made. Personalisation is also a key focus of both inbound and ABM – though it is even more important with account-based marketing, since the approach is all about treating companies as a market of one. With so much common ground, it’s more than possible for B2B companies to merge the inbound marketing and ABM funnels to optimise results. Inbound marketing can be used as it always is – to identify potential sales leads. 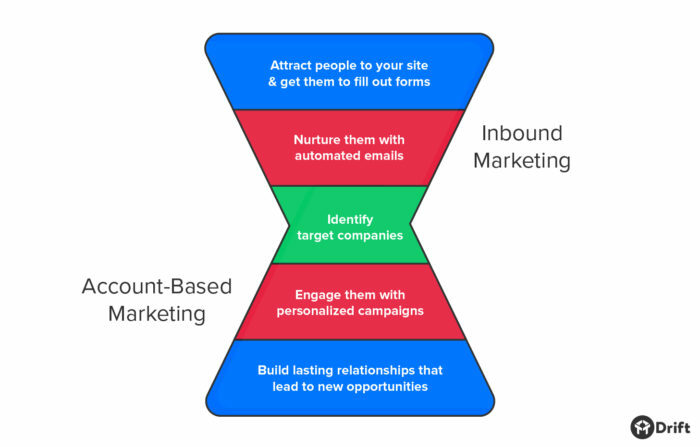 However, when a company integrates account-based marketing with their inbound strategy, as soon as a prospect enters the middle stages of the traditional inbound funnel, ABM tactics can be used to identify whether the individual works at a “best-fit” organisation, and, if so, resources can then be allocated to expand the reach within the target account and win the attentions of additional buyers and decision-makers at the organisation in question. In this way, your inbound marketing funnel can essentially flow into your ABM funnel, creating the very best of both worlds. Account-based marketing recognises and addresses the fact that today, there are more people involved in the B2B buying process than ever before. 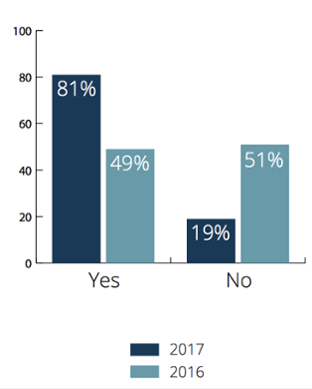 In fact, recent figures from DemandGen reveal that in 2017, 34% of B2B buyers have increased the number of stakeholders involved in the B2B purchasing process, meaning there are now between 7 and 20 people involved in any B2B buying decision that’s made. In addition, as the number of decision-makers increases, the likelihood of purchase decreases. Account-based marketing tackles this challenge head-on with the simple yet elegant solution of targeting all decision-makers within a target account at once – as opposed to just individual sales leads that emerge from inbound marketing campaigns. As such, account-based marketing acknowledges the fact that successful B2B marketing requires a company to engage with and win the advocacy of a whole group of influencers on an executive board, and not just isolated individuals. ABM works to target these core decision-makers – delivering only the most relevant messages to only the most relevant people – thusly generating group interest and advocacy within an organisation, which increases the chances of making a sale. Account-based marketing is no longer an industry buzzword, and adoption rates are increasing the world over. Indeed, the approach really took off in the B2B marketing space between 2016 and 2017 – the ‘2017 State of Account Based Marketing Survey’ from #FlipMyFunnel revealed that in twelve months, the ABM adoption rate grew from 49% in 2016 to a massive 81% in 2017. The reason for the surge is that ABM delivers results. 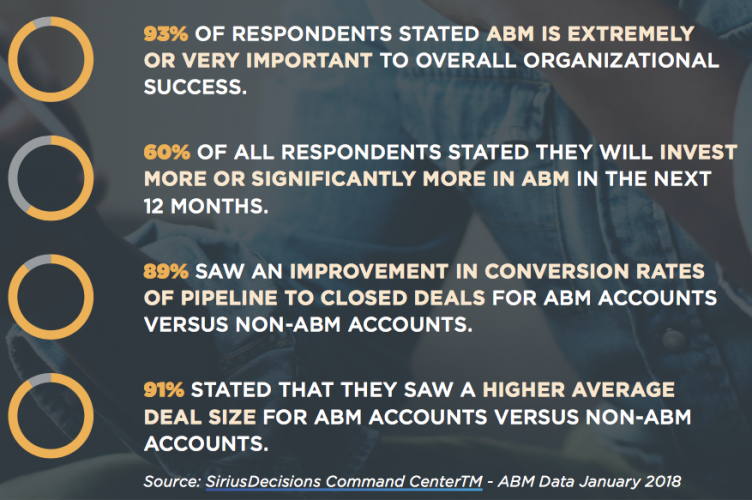 Indeed, a 2018 report from DemandGen indicates that account-based marketing practitioners are reaping huge benefits from the approach, and well over half (60%) will be investing more in ABM over the next twelve months. 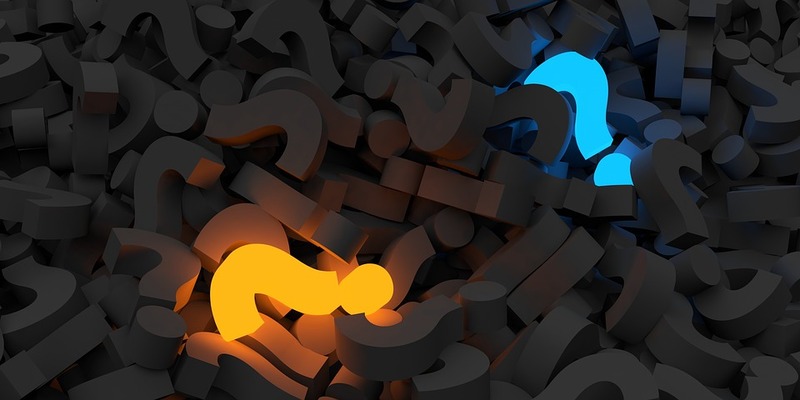 So – do you need to develop an ABM programme at your organisation? Well, the numbers speak for themselves. If you’re in B2B, account-based marketing could well be the game-changing strategy you need to supplement your inbound efforts. Laser-focussed and hyper-personalised, ABM has the potential to make an enormous impact on your B2B marketing, give you the chance to develop more relationships with more individuals at best-fit accounts, and send your conversion rates through the roof. If you need help developing an account-based marketing strategy at your organisation, get in touch with us here at Cope Sales & Marketing – www.cope-salesandmarketing.com. We’d love to hear from you, and will be very happy to chat through your requirements.